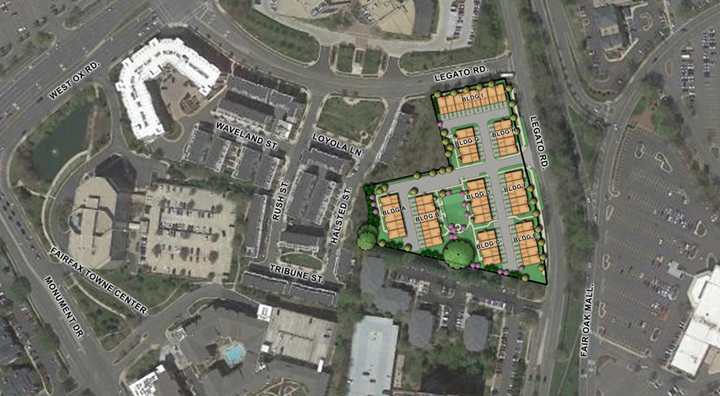 On June 19, 2018, the Fairfax County Board of Supervisors approved a rezoning application by JAG Development Company, LLC, that will pave the way for the construction of 90 multi-family dwelling units in the Fairfax Center Area, adjacent to Fair Oaks Mall. The rezoning action followed an amendment to the Fairfax Center Comprehensive Plan approved in September 2017. Previously, the site had been planned for institutional and office uses. The amendment added a residential option. The 3.93-acre site located west and south of Legato Road has been used as a church since 1962. The property is bordered by Ragan Oaks Apartment community to the south, the Centerpointe townhome community to the west, and the Centerpointe office buildings to the north. The property is the last non-redeveloped parcel along Legato Road. JAG plans to develop 90 two-over-two multi-family units arranged around a centrally located open space area. It is anticipated that there will be four Affordable Dwelling Units and seven Workforce Dwelling Units. The approved density is 22.9 dwelling units per acre, which includes bonuses related to ADUs and WDUs. Being the last non-redeveloped property along Legato Road, this redevelopment will complete the Centerpointe neighborhood which includes a mix of offices, multi-family rental and condominium units, two-over-two units, and traditional townhomes. This new development will complement the surrounding area by remaining consistent with its high-quality aesthetic and urban-style architecture. Approximately 36% of the site will be community open space. Elizabeth Baker represented JAG on the plan amendment and rezoning action.